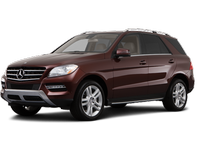 While Mercedes-Benz will always be a quintessentially German automaker, its M-Class SUV has always been an American at heart. To begin with, it's built in Alabama and has been since it first burst onto the scene as one of the first luxury SUVs. The U.S. of A is also the M's primary market, as its sizable dimensions and traditionally thirsty engines play much better in Frankfort, Kentucky, than they do back in Frankfurt, Germany.